Graham County early in its history developed into many separate communities each of which has its own interesting heritage. Some thriving communities were inundated by the construction of the various lakes in our county. A memorable example of this was the Japan community, known earlier as Welch or Homestead. Other communities disappeared as the population shifted, highways changed, or the community was simply renamed. Such communities as Rough, Johnson, Brock, and Millsaps come to mind. Small rural schools and post offices were sprinkled about the county. As various services were combined, many small communities lost their identity. All our communities past and present are deserving of attention as we recall our county history. About 1910 the Aluminum Company of America began the investigation of the Little Tennessee River watershed for power sites for aluminum production. From this the Knoxville Power Company, which had been chartered in Tennessee in 1900, was purchased. Then the Howard farm where Calderwood Lake is now located was purchased. This became the headquarters camp for field engineering as well as other work later. The railhead was six miles down river at Chilhowee where the Southern ran a train every other day. Surveys were made over the line in North Carolina and negotiations began with companies owning land and having hydropower rights in the Little Tennessee watershed. By December 13, 1913, the Aluminum Company had bought the capital stock of Tallassee Power Company, Western Carolina Power and Transportation, Union Development Company, and Union Power and Water Company. Frank Chapman and J. S. Bailey combined all of this in North Carolina into the Tallassee Power Company that had been chartered in 1905. Tapoco, Inc's. property in North Carolina is a successor of Tallassee Power Company. In March 1914 the Aluminum Company had placed a small aluminum plant in operation just north of Maryville, Tennessee using purchased power. During the summer of 1915 there was a sharp increase in the demand for aluminum due to the European War. It was then decided to proceed with the Cheoah Development, so named because it was near the mouth of the Cheoah River. The Southern Railway Company had graded some roadbed between the state line and Chilhowee. However, due to the slow progress, arrangements were made for the Power Company to build the railroad for Southern to Calderwood (then Alcoa) for the Power Company's Cheoah Dam site. Regular train service from Knoxville to Alcoa (now Calderwood) began March 13, 1916 and the extension to the Cheoah Dam site was completed in September 1916. On March 1917 the first concrete was poured for Cheoah Dam and on December 8, 1918 the closure of the dam was made. On April 6, 1919 the powerhouse began operating. There were several world superlatives in this development: the 225 ft. dam was the highest overflow dam; the turbines were the largest (with some aluminum company ones on the Yadkin River); and the 150,000 volt transmission line was the highest voltage and had the longest span for a transmission line - 5010 feet across the river below Cheoah Dam. Tapoco was first called Cheoah but soon after the construction of the dam started in 1916, the name was changed to Tapoco to avoid confusion with Cheoah on Sweetwater Creek. The name Tapoco was coined by using the first two letters of Tallassee Power Company and won a $25.00 prize in a contest. Early 1916 there was nothing at Tapoco except a survey camp. The Dave Orr clan lived about three miles away on Bear Creek and the Andy Williams clan about a mile away on Meadow Branch. It is said to have been a laurel thicket and quite rough. A lot of dirt was hauled on railroad from Calderwood to make the present lawn. By 1916-1919 Tapoco was estimated to have a population of about 2,000 people with about 400 of them black. On the west bank of the Little Tennessee, just below the present bridge, S. C. "'Screwdriver" Rogers says he built 280 (12 x 16 ft.) sleeping units with built-in beds and tables, and a mess hall for the blacks. At the present location near the mouths of Meadow Branch and Yellowhammer Branch, construction type dwelling houses, bunkhouses, and mess halls were built for the whites, and a hospital, theater, and commissary were built for general use. A two-teacher school operated during this time and is now used as Bethel Baptist Church. In the early 1920's the Tallassee Power Company, in cooperation with Graham County, built a larger building for Beers High School on Meadow Branch (now residence of R. V. Williams). It never did have a last year of high school and in the late 1940's was an elementary school only. Late in 1920 a new railroad bridge was built across the Little Tennessee a few hundred feet below the mouth of Cheoah River to replace a construction bridge to the Cheoah Power house that had been washed out in April 1920. The railroad was extended up the Cheoah River a short distance to enable the Kitchen Lumber Company to begin logging operations along the Cheoah River. Kitchens logged this area in the 1920's and built rail lines up Deep, Barker, and Bear Creeks using the power company railroad to take logs into Tennessee. During this time Kitchen had a camp on Bear Creek in the "Orr Mountains." Above, Power company railroad to Santeetlah Dam. The Santeetlah Development's actual construction operations started in January 1926. The first concrete was poured on July 20, 1926 for the 212 feet high by 1054 feet long dam. The lake began to fill April 10, 1928. The powerhouse at Rhymer's Ferry began generating power on June 7, 1928. Contracts were made to Thomas Conner and Sons for construction of five water conduit tunnels; to Chicago Bridge and Iron Works for the steel pipe and surge tank; and to Walsh's Holyoke Steam Boiler Works for the twin penstocks. The water from the dam to power house travels a 26,123 feet course composed of 5,821 feet of steel pipe, 19,355 feet of concrete lined tunnels, and a pair of 947 foot-long penstocks. This gives the water a fall of 663 feet. The contractors had construction camps along the pipeline. The power company had a construction camp at the dam site and also one at the powerhouse near Rhymer's Ferry. After construction, the Rhymer's camp was converted to a village with 12-15 permanent houses. For a short span a one-teacher school was operated with some of the students crossing Cheoah Lake by boat from Swain County. A church also had a short life span there. The church and school were closed when a road was built to Tapoco in the mid 1930's. Prior to the road, a boat and barge was operated daily to Cheoah Dam for freight and passengers. Also N. C. 288 was opened prior to this and was used as access to Tennessee and Bryson City. The village was torn down in 1962 when the powerhouse was automated and remote controlled from the Cheoah Powerhouse. During and after construction of the Cheoah Dam, the power company operated a private railroad from Tapoco to Calderwood, hauling passengers and freight. 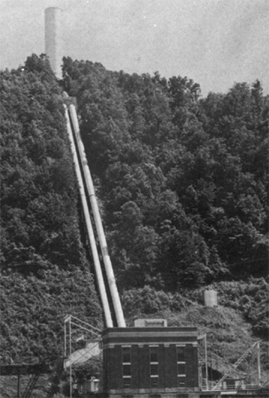 At the beginning of Santeetlah Dam's construction the railroad was extended up Cheoah River to the dam site. The passenger or work trains were pulled by "rod" engines, but the freight trains were pulled by Shays. After Santeetlah Dam was completed in 1928 the railroad above Tapoco was abandoned except that part used by Kitchen Lumber Company. When Calderwood Dam was completed in 1930 the Tapoco to Calderwood Railroad was covered by the lake. A boat operated by the power company replaced the rail bus and freight train until a highway was completed. In 1929 Tallassee Power Company transferred the railroad bridge across the Little Tennessee, below the mouth of Cheoah River and the construction railroad grade to Santeetlah Dam to the N. C. Highway Commission. These were converted to part of N.C. 108 (later U.S. 129) which was completed to Deal's Gap in 1931 to make connection to N.C. 288 to Bryson City and Tennessee 72 to Maryville and Knoxville, Tennessee. Tapoco's isolation was removed with the completion of this highway and also to some extent for Graham County. This was the beginning of the tourist trade. After construction activities, the Tapoco area adjacent to the post office decreased to about 25-30 residences. These have decreased to 15-20 houses with employees living on nearby Meadow Branch and Farley Branch as well as places all over the county. Meadow and Farley Branches have had a large increase in population. Tapoco also served two retirement home developments (now 25-30 houses) and Crofton's Motel that are 3 miles away on U.S. 129 in Swain County. The power company operated a boarding house until Tapoco Lodge was completed in 1930. (7 cottages were later added) then becoming a tourist resort. The most noteworthy and best-liked resident Tapoco has had was a one armed black man by the name of Eli "Trix" or "Trixie" Williams. Trix came with the blacks during construction but when other blacks left, he stayed with the boarding house as a "lobby hog" - making beds, etc. When the Lodge replaced the boarding house Trix became the janitor, fireman, and porter. In 1946 he retired from all jobs except porter until 1954 when he returned to his native Shelby, N. C. to live with relatives because of terminal illness. He died in February 1955. Trix is still remembered for his friendly laugh and his special touch in ringing the dinner bell. Also during his stay at Tapoco he was the only black resident of Graham County, except during the construction of the dams in the county (Cheoah, Santeetlah, and Fontana). Bethel Baptist Church, Tapoco - "A revival meeting, conducted by Rev. Willie Rogers and Rev. George Turpin, beginning Nov. 19, 1927, resulted in a number of conversions and the outpouring of the Spirit of God on the Christian people of Tapoco, N.C. causing the people of Tapoco to see and realize the need of a place of worship." And so the minutes record the beginning of Bethel Baptist Church. A presbytery met Dec. 24, 1927, and consisted of the following members: ministers; P. Elliot, moderator, Willie Rogers, George Turpin, Burder Shope, Oliver Orr, and deacons; Jeff Millsaps, D. Anderson, and Clarence Adams. Charter members were: Mrs. Dovie Turpin, Mrs. Beulah Higdon, Nelson Higdon, Jake Orr, Clarence Adams, Henry Turpin, Mrs. Josie Grant, and Mrs. Cora Debuty. Nelson Higdon served as clerk pro-tem. Fourteen members were received by experience of grace and baptism and six under the watch care of the church until their letters were received. Nelson Higdon, Henry Turpin and Jake Orr were appointed to be ordained as deacons. The Rev. Willie Rogers and W. H. Garland were elected pastor and church clerk, respectively, for the ensuing year. "The offerings during the meeting and organizing of the church were liberal, amounting to more than $100.00." Nelson Higdon, Jake Orr and C. F. Debuty were ordained as deacons on Jan. 16, 1928. The new church secured from the Tallassee Power Co. permission to use the former school building. Some years later the church assumed the maintenance of the building. Improvements made include the addition of five Sunday school rooms, hardwood floors, paneling, pews and church furniture, a piano, and a furnace. After the completion of the Tapoco-Rhymer's Ferry road in the middle thirties many members of the Rhymer's Ferry Baptist Church became members of Bethel Church. The church, being in an area where there has been a large population turnover and where there are no churches of other denominations has served not only the spiritual needs of its members but also those of all the people who have come to worship there. Pastors who have served the church are: Will Rogers, B. F. Shope, G. L. Turpin, Mose Woodward, Gardner Williams, W. F. Sinclair (Methodist minister from Robbinsville who held Sunday night services for about a year when the church had no pastor), Roy Garland, John S. Stansberry, Ronald Holland, Arthur Randolph, Charles H. Pearson, Clifford George, and Burlen Aldridge. For many years the offering was the pastor's salary and sometimes was only a few dollars. Charles H. Pearson was the only full time pastor.